Firstly sincerely sorry for the trouble taken to you all, and we have noticed this issue. Hope you all have a nice day, and thank you in advance for sharing your kindly understanding. Please also include in the fix for tl-sg1024de_v2. Thank you. Please include in the fix for model tl-sg1024de_v2. Even if Easy-Smart is code for Lightweight Smart Pretend Managed, the current state of the firmware renders these otherwise credible switches as not fit for purpose. I know of several sites including mine where fingers have been burned by investing in these switches. If TP Link doesn’t release a fix / workaround very soon it’s good name will take a major hit. Recently I bought the TL-SG105E - the smaller version of the TL-SG108E. While configuring a VLAN I tried to remove some ports from the default VLAN but no luck. I kind doubt myself if this was normal or not as the TL-SG105E is from a brand that sells mostly network equipment so they couldn't be so lame to have this wrong....or could they? So I went to my Zyxel GS1900-8 and figured that the TL-SG105E.has this huge firmware bug. 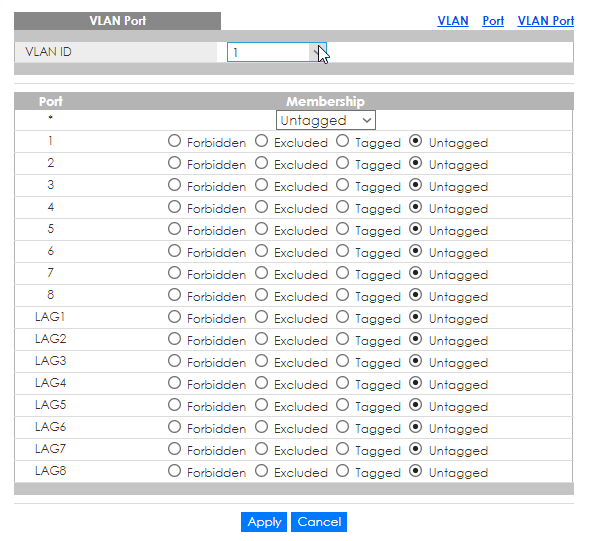 In my Zyxel, aside from being able to change the default VLAN ID from 1 to something else, it's also possible to exclude ports from any VLAN including the default. There's a risk with being able to change the membership of the default VLAN: one could be locked out from the WEBUI but it can be undone by reseting the switch to factory default or preventing one from removing all ports from the default VLAN. Nevertheless, for a "business line" equipment, it has kind of a "noob" feature! Maybe it's targeted for "noob businesses", who can tell. I just hope they fix this soon otherwise I'll to sell this to someone who doesn't care for this VLAN issue and buy something that isn't flawed. I'm attaching some zyxel screenshots in case there's some TP-Link engineer watching. Maybe he can get some ideas out of it. This risk can be avoided by the firmware assigning a port back to VLAN1 if it is not a member of any other VLAN. This is implemented this way in TP-Link's smart switches such as in the TL-SG2008 or the T series. Just bought a TL-SG-108E v3 and not being able to remove ports from VLAN1 is not good, can we get a beta version? I'd like to try before my 30 return period is up. I have 12 days to return, if TP-Link does not provide the patch, I am returning this unreboarded product. Is there any new firmware for V2?